Our 2019 Calendar is out now! For more than ten years The U Foundation has worked with The Bushcamp Company, supporting rural schools in the South Luangwa Valley in Zambia. Children from Chiwawatala Basic School take part in an annual art competition, with the winning entries being displayed in the calendar. Whilst the calendar is used to raise funds for these schools, it is also a way to focus the children’s attention on issues that affect their daily lives. 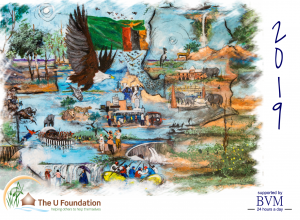 For the 2019 calendar the children were asked to think about conservation and community and their responsibility for ensuring that the Luangwa Valley will continue to thrive and protect its abundant natural resources. We are asking for a suggested donation of £5 for each calendar, with every penny going towards school projects in the Luangwa Valley.